A four star luxury Hotel that defines tradition, prestige and hospitality in a peaceful atmosphere.The hotel is ideally situated just a walking distance from the centre of Tirana, cultural and tourist attractions. The hotel offer a unique blend of Albanian hospitality and friendly service which makes it the Inspired Choice for Business or Leisure. The comfortable and spacious accommodation features the latest facilities and outstanding view over Tirana. It is defined as best quality hotel in Tirana, and it has conference rooms, restaurant and luxury accommodation. 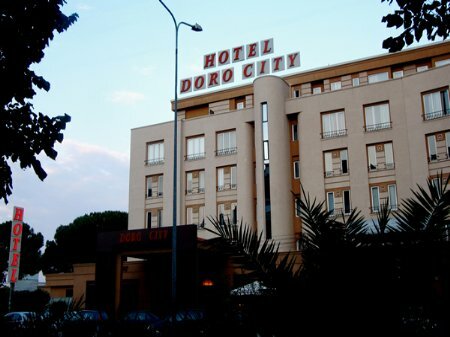 With 53 rooms and professional conference facilities, Hotel Doro City is the ideal location and a best value hotel for a business or leisure activity in Tirana. Its location makes this four star Hotel pretty accessible from either Mother Theresa Airport which takes 20 minutes or Center Tirana only 5 minutes far away respectively.